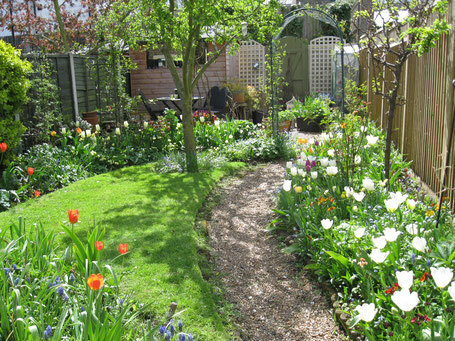 The garden path was straight and narrow – a practical, durable, concrete strip. To its right a narrow rectangular bed of imprisoned plants, to its left a rectangular lawn. I disliked the path. I resented the way it constrained all else in the garden. For years I accepted its inevitability and worked around it as best I could. But when I started to draw imaginary gardens, the straight path became serpentine; the beds flowed with it, ebbing and flowing in their shape; curves replacing straight lines. For the first part of my life I set out to be what I felt others wanted me to be: to do the correct thing, say the right word, to give my energy to what others set out for me. The path of my life was straight, the beds narrow. Whatever originality, creativity, curiosity or difference there was within me was hemmed in by my desire to fit in, and my fear of how others would respond to me. But in the second part of my life the desire for freedom broke through: to let loose and let live the energies and thoughts and life within me, however quirky all that might be. Not straight lines and order, but curves, unevenness and ‘room to grow’. So the concrete path had to go. I had little confidence. I lacked proper tools or know-how. With hammer and chisel I somehow cracked the slabs and wobbled the remnants away. I was all too conscious of eyes from neighbours’ gardens watching me get rid of a perfectly serviceable garden path. I marked out my river, bit with my spade into the squareness of the lawn and dug out my path. I edged it, put down sand and gravel, and stood up to admire the result. It is some years now since I defied my perfectly formed but oppressive concrete path. Another house and garden has followed, as have flowers, fruits and vegetables in abundance, flowing like a river from creation’s spirit, my spirit, God’s Spirit. Listen to what God is loosening from a concrete hold. Pay attention to what is emerging from God’s Spirit in your spirit. Do not be afraid of that strange originality God draws you to become and share. Dare to dig up the oppression that experience imposed on the course of your life. Defy the disapproving voices and glances that advise you that it’s better to be unhappy than to be a fool. There is a new garden, just waiting to become.